Ukrainian, Russian…and 18 others? The debate over Ukraine’s official languages enters a new chapter – but who are the real beneficiaries of a proposed new law? Ukraine is not an easy country to understand. It possesses a great number of ambiguities, perhaps the most salient of which is the issue of language. On the one hand, according to the 2001 national census, 78% of the population of Ukraine consists of Ukrainians, and most of them (85%) claim Ukrainian as their native language. On the other hand, about 50% of Ukrainian citizens (the figure varies in different surveys) declare Russian to be their “language of convenience” (or “language of daily communication”). Many Ukrainians who speak Ukrainian at home are ashamed (or afraid, because of symbolic violence) to speak it in public. As a result, in most Ukrainian cities, even those with a Ukrainophone majority, the Ukrainian language is virtually unheard. The very notion of linguistic minority / majority in Ukraine becomes therefore ambiguous and susceptible to manipulations. The Ukrainian Law on Languages (1989) and national Constitution (1996) contribute to the ambiguity rather than try to solve it. Both documents recognize Ukrainian as the sole “state language” whereas Russian is placed among other minority languages that can be legally used and protected by law alongside the “state language.” No legal mechanisms, to enforce effectively the use of the “state language” have ever been elaborated, however. This absence has resulted in a de-facto laissez-faire policy. The language law has been applied, like many other laws in Ukraine, arbitrarily, selectively, and in a highly opportunistic manner. As a result, both Russophones and Ukrainophones are dissatisfied with the situation. Each side feels that the state is not “theirs” to the degree they would like it to be. The reason for such alienation is to be found, however, not in the lawless, corrupt and uncivil character of the state, but rather in the language(s) it imposed on its citizens – too much Ukrainian, from the point of view of Russophones, and (still) too much Russian, from the point of Ukrainophones. The latter, as the “titular nationality,” have some privileges de-jure and would like to assert them de-facto. The former, as the imperial majority in the past, still enjoy their dominant status de facto and would like to prevent the possible change of the postcolonial status-quo de-jure. The best way to maintain the Soviet-style status-quo would be to amend the 10th paragraph of the Ukrainian constitution and grant Russian the status of the “second state language” alongside Ukrainian. Such an amendment requires, however, a qualified majority of two-thirds of the MPs in the parliament, which is hardly achievable. Consequently the authorities used a tricky subterfuge under the pretext of implementation of the European Charter of Regional and Minority Languages ratified by Ukraine nine years ago. The Party of Regions submitted a draft law “On the fundamentals of the national language policy” last August in the Ukrainian parliament, which was approved at the first reading, without any discussion, on June 5, despite very critical comments by the respective parliamentary committees, expert community, NGOs, the OSCE High Commissioner on National Minorities, and the Venice Commission. The law stipulates that any of 18 “regional and minority” languages spoken by 10 (and more) per cent of the people in a certain administrative region can be used in that region as the “official” language alongside Ukrainian. Leaving aside the AP revelations on “banning the use of Russian” (not the greatest stupidity ever enunciated by Moscow-based Western journalists), and without asking politely the names of the mythical “hospitals, courts, and other institutions” where the use of the Russian is prohibited, one may ask a much simpler question. What is the expected budget of the internationally praised law? How much would it cost for the state to provide the service in all 18 languages – alongside Ukrainian? International reporters might be fully satisfied that Ukraine has met its “European obligations.” But the Ukrainian parliamentarians and, in particular, Messrs. Kivalov and Kolesnichenko who sponsored the bill, should have been more apt and precise in their law-making. What are, indeed, the estimated costs of law’s practical implementation? There are two possible reasons why the Ukrainian lawmakers have never discussed this mundane issue. First, they are not going to implement the law or even pass it after the final reading. This means that all the buzz around the law is just a PR-campaign aimed at mobilization of the Russian-speaking electorate on the eve of parliamentary elections. And second, more likely, the politicians’ concern for the 18 languages masks their real concern about one single language, which is particularly dear to the bill’s sponsors. And this language, Russian, is so firmly established in Ukraine, in most regions and almost all areas, that no extra budget for its promotion is needed, especially, if it is introduced instead of Ukrainian rather than alongside. This seems to be actually the main goal of the language bill: not to protect Russian, which is the dominant language in most regions and areas, but to marginalize further and ultimately eliminate Ukrainian. Or, as Volodymyr Kulyk, a leading expert on language politics in Ukraine has aptly remarked, they are fighting not for the right to use Russian, which is actually used everywhere, but for the right not to learn and not to use Ukrainian under any circumstances. The bill, besides its numerous contradictions, ambiguities and mistakes, has two fundamental flaws in its very concept. First, it speaks about the right to use Russian (and, hypocritically, other languages, even though they barely meet the 10% threshold anywhere, with a few minor exceptions) but it says nothing about the duty to learn and use Ukrainian. And second, it does not distinguish the rights of citizens to choose the language of their convenience and rights of civil servants (or, rather, lack thereof) to do so. Both flaws are significant because they reflect the Soviet mentality of the bill’s promoters and the way they envisage the so-called “bilingualism” in Ukraine. The bill has nothing to do with the official bilingualism in some Western democracies where the citizen has priority while the state (state officials) must provide services in the customer’s language of preference. The Soviet type of “bilingualism,” on the contrary, prioritizes the state, i.e. the bureaucracy that chooses the preferable language (inevitably Russian) and imposes it upon citizens. If anyone should doubt how the system works, let them go to Belarus where two “state languages” theoretically co-exist, or to Transnistria, or, even to Crimea where three “official languages” were established long ago, and try to start a discussion in these places in Belarusian, Moldovan,Tatar, or even in Ukrainian. The bill merits harsh criticism, but the arguments employed by its critics from the Ukrainophone camp are, in most cases, weak and, in long run, self-defeating. They target typically the very idea of bilingualism as unsuitable for Ukraine, even though the bilingualism exists in Ukraine de-facto and should be properly formalized de-jure. Such a formalization is a nightmare for Ukrainophones because the Soviet (and post-Soviet – Crimean, Transnistrian, Belarusian) experience tells them clearly what “bilingualism” is likely to mean in a country with no rule of law and strong predominance of the post-Soviet / Russophone bureaucracy and oligarchy. The above notwithstanding, the idea is not necessarily bad in principle. Loyal citizens who pay taxes have a right to get services from the state in their language of preference. Civil servants have responsibility to deliver these services in the language chosen by the client, not by themselves – a practice conducted in the Soviet Union and still prevalent today. A clearly outlined and properly regulated bilingualism would have benefited Ukrainophones in south- eastern regions where they have such rights on paper but not in reality. Such a bilingualism would require tough and strictly enforceable rules on language usage, hiring and firing of personnel, attestation and penalization, and so on. Of course, this would entail a firm rule of law, which has never been strong in Ukraine and has been completely dismantled under Yanukovych. But it does not mean that the idea of official bilingualism in some regions should be rejected wholesale. Rather, it should be placed in a proper context, with due accent on the rule of law, rights of all citizens including Ukrainophones, and the responsibility of the ruling bureaucracy to be bilingual and support citizens’ rights to use their language of preference, not vice-versa. This impasse means that ambiguity will persist in Ukraine for the foreseeable future, and power politics will continue to prevail everywhere, including the sphere of language. The bright idea of European bilingualism has been rejected by Ukrainophones because they do not believe it is viable in a lawless post-Soviet country, quite reasonably suspecting that any bilingualism here would be Soviet, rather than European. And Russophones are not interested in European bilingualism because they still enjoy the Soviet-style bilingualism that suits their needs much better. 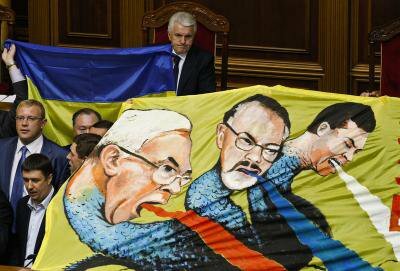 All they need is merely to legitimize their right to ignore Ukrainian and to preclude any possibility of changes. The Kivalov-Kolesnichenko bill is just one of many attempts to ensure the dominance of one group over another. It resolves no problems, but rather multiplies them. And this is unfortunately what the governance of the Party of Regions is all about.